Based on the taste of rice pudding giving it a little twist. The rice cook in almond milk but not too much liquid like we make pudding, so we can handle the rice and shape it into sushi roll. I also intentionally make the sauce from kiwi, the green color imitates wasabi's. The dessert would be fun to look at and fun to eat. My American mother-in-law loves steam rice, but somehow she feels intimidating ... how many cup of rice I use? how many cup of water I should add? The rice cooker is packed in the attic... such and such questions so bothering that she's eventually back off. So during my latest visit to her, we made steamed rice together. No need for a rice cooker nor measuring cup. Used a pot that's big enough to fit my hand in, poured in the rice (normally half a cup good for 1 person as a meal ... but due to the size of the pot we got to cook 1 cup at least), then laid my hand flat on the rice, added water until the level reached my fingers' middle join. Lid on, once the water boiled, lowered the heat to the lowest setting and kept simmering for 20 minutes. In the first 10 minutes you can open the lid once (only) and give the rice a quick stir. After 20 minutes, turned off the heat but the lid still on for another 10 minutes. 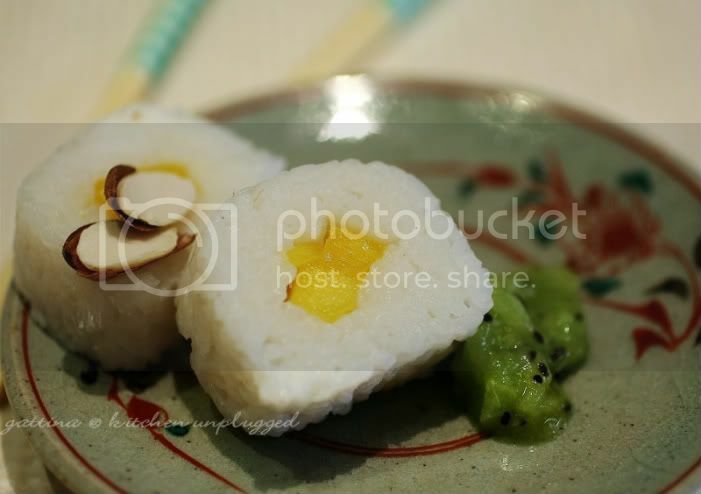 Used 1 cup of sushi rice... as for a dessert it would be plenty, enough to make 2 - 3 sushi rolls or for 6 persons. The rice was cooked in almond milk and small spoonfuls of sugar. I intended not to make it sweet as I would have the sweet sauce. Once the rice was done, gave it a good stir and let cool completely. Used a sushi mat, lined with a piece of plastic film. 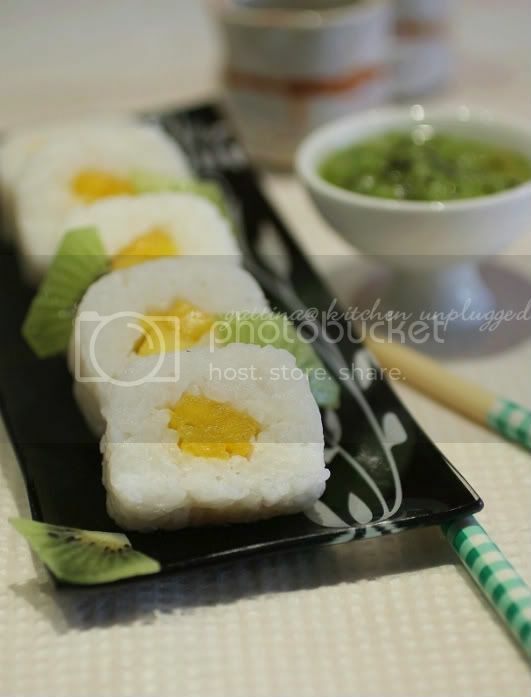 Slightly wet my hand/fingers, spread out a layer of rice, arranged mango strips in the middle, rolled up the rice. Unrolled the mat but let the plastic film wrap the rice log tightly for an half day, it'd be easier to slice for later. Used a very small pot to boil some water and sugar, simmered for several minutes to make simple syrup. Added vanilla essence and diced kiwi. Pureed. Sliced the rice rolls, kiwi sauce served on the side. Love this rice roll, Gattina! Alond milk rice rolls look superb! These almond milk rolls look delightful, gattina!! They way you make rice is exactly like me, except the part about putting you hand in and measuring with your fingers - I still use the 1 cup rice to 2 cups water method. I love the rolls - what a clever cross over idea. I love everything with mango, and your idea is fantastic! Your bio was very amusing to me. I'm Viet, raised in Italy, lived in the US, back to Italy and married to an Italian. And I have to sing your praises now that I've found your blog!! I haven't been this excited in forever. Love your cosmopolitan flair for cooking/baking, your talent and PRECISION of execution. Oh gosh, you're my new guru.